In each of the seminars, workshops, and kickoffs I’ve attended someone has asked the (very reasonable) question: “How many teams advance from League Tournaments to the Regional Championship?” This can be an important question, as the answer can directly impact a team’s overall robot design and competition strategy for the season. The standard response to this question is that there’s no way to precisely determine the advancing teams until event registration, and that it’s all based on dividing the available Championship slots proportionally based on the size of the events leading to the Championship. Dr. Tiernan has additionally said that league teams will have a larger number of opportunities to advance relative to teams competing only in Qualifier Tournaments. But if the answer affects a team’s strategy and planning early in the season, how do we figure out what will happen in real, practical terms? I thought I’d take a crack at breaking this question down into some hard numbers to give coaches and teams an idea of what we might expect. This article begins by first presenting my “bottom line” conclusions, and then providing the assumptions and reasoning I used to arrive at those conclusions. I should first make a big disclaimer: I have no official capacity in the region, so nothing I say here is determinative of how things will turn out. It’s just my best guesses based on analysis of available evidence. Assuming the region has five leagues of approximately 12 teams each, and a Regional Championship supporting 36 teams, I conclude that each league will likely advance four teams to the Championship. Furthermore, I speculate there will be three or four Qualifying Tournaments, each of which will advance 4-6 teams to the Regional Championship. I think this conclusion is valid even if the number of leagues or teams per league varies a bit. My reasons for arriving at this conclusion are detailed below, but the short summary is that 20 or so teams will end up advancing from leagues (5 leagues * 4 teams each), and a total of 16 teams will advance from qualifiers. There could be a tweak of a slot here or there due to event size differences, but 4 teams advancing from each league event seems to be the most reasonable expectation. The Inspire Award 3rd place team will advance only if at least one of the Winning Alliance teams also received Inspire 1st or Inspire 2nd. There’s a reasonably good chance of this occurring, but it’s not guaranteed and I’ve seen many events where it does not happen. The Think Award Winner will advance only if both of the Winning Alliance teams received Inspire Awards. It’s possible, but not very likely. The Finalist Alliance Captain will advance only if both of the Winning Alliance teams received Inspire Awards AND one of them also won the Think Award. It happens, but it’s very unlikely. The Connect Award Winner will advance only if the Finalist Alliance Captain had already advanced due to receiving one of the previous Inspire or Think awards. The Finalist Alliance 1st pick has a very small mathematical possibility of advancing. This happens only when the Finalist Captain advances AND both the Think and Connect award winners also won Inspire 2nd and Inspire 3rd in some combination. None of the other awards at the event advance unless there are teams that had already advanced prior to the tournament. 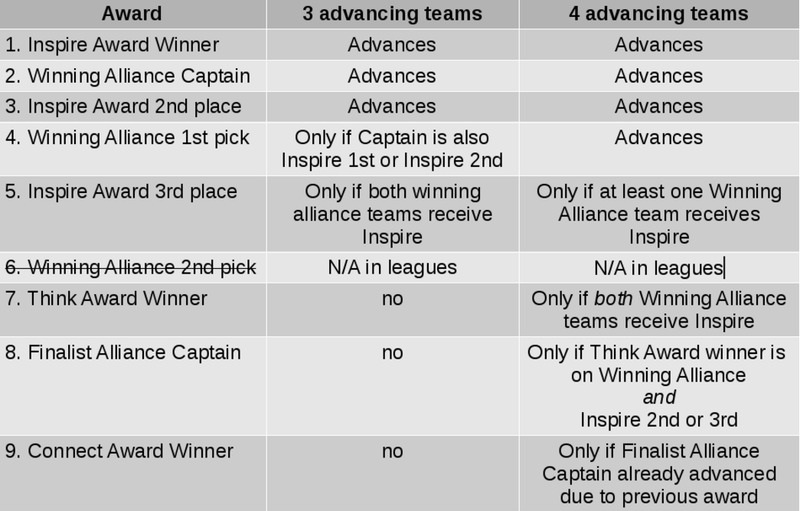 To summarize this into a single sentence: For an event advancing four teams, the two Winning Alliance teams and Inspire 1st/2nd teams definitely advance, Inspire 3rd has a plausible chance of advancing, and teams after that (including the Finalist Alliance teams) have to hope that the awards somehow break “just right” in order to advance. The seasonal implication is that in order to advance from an event with 4 teams advancing, you really need to be on the Winning Alliance at the end of the tournament or receive one of the Inspire awards. Focusing efforts into a single award category is unlikely to advance. A1: The North Texas FTC Regional Championship ends up with 36 teams this season, as in previous years. Logistically speaking, 36 teams is the largest size that can be accommodated in a single-day, single-division competition. More teams than 36 requires either a two-day event (more time), two divisions (more space, more fields, more volunteers), or both. I’m always hopeful for a larger Regional Championship event, but the official information I have thus far still indicates a 36-team championship. The size of the championship has the greatest impact on the calculations of advancing teams. A2: There will be five leagues. As of Oct 13 I’m aware of five draft leagues for 2016-2017 (Amethyst, Emerald, Garnet, Sapphire, and Topaz), but those only seem to cover areas east of Fort Worth so there may be a sixth league somewhere (west of Fort Worth, or in the Killeen/Waco area). And as far as I can tell, the calculation of advancing teams works out about the same whether the region ends up with four, five, or six leagues. A3: Each league will have around 12 teams. Last year’s Emerald League had 11-12 teams. Most leagues in 2016 seem to have been drafted with 18-20 “teams” assigned to the league, but some entries appear to be duplicates of existing teams or teams are from previous years that are no longer competing this season. There will also be some teams in each draft that cannot participate in their assigned league because of resource or scheduling issues. So from this and discussions I’ve had with other coaches it looks to me like most leagues will end up on the smaller side, with 10-13 teams. The exact number doesn’t seem to be important — the end result (four teams advance) doesn’t seem closely connected to the outcome. The standard in FTC is that advancement slots to a championship event are to be divided proportionally among the events feeding that championship event. So, if there are 100 team entries across events collectively competing for 20 advancement slots, each event should be allocated 20% of the slots. In such a scenario a 20-team event would advance 4 teams, a 30-team event would advance 6 teams, and so on. That 144 total is greater than the number of teams in the region because some teams chose to compete in more than one advancing event (e.g., two qualifiers). Still, it’s reasonable to expect that teams in the region will want at least as many opportunities to compete/advance in this season as were requested in last season. So, with a base of 144 team entries in the region competing for 36 advancement slots to the championship, the standard proportional calculation would have each event advance 25% (36/144) of the teams competing in that event. For a 12-team league, a 25% advancement percentage would indicate that three teams would advance from the league to the regional championship. However, Dr. Tiernan has said that league teams will have “greater opportunity” to advance than teams that compete only in qualifiers, which means that a 12-team league should receive four advancement slots. QED. The better answer is to guarantee each league at least four advancement slots, and balance any needed “extras” needed for larger leagues from the Qualifying Tournaments. Oh yeah — what about those Qualifying Tournaments? Based the above assumptions and calculations, it appears to me that the region will likely need three or four Qualifying Tournaments, and each Qualifier will advance 4-6 teams. Assuming a Regional Championship of 36 teams, and five qualifiers advancing four teams each, that leaves 16 advancement slots to be divided among any Qualifying Tournaments in the region. If the region has demand for 144 entries (as indicated by previous seasons), 60 of those are provided by the five leagues of 12-teams each. This leaves 84 competition slots to be covered by Qualifying Tournaments. At least three tournaments will be needed for that, and four tournaments would be better to keep each to reasonable sizes (and maximize teams’ opportunities to participate). Assuming each of the four qualifiers have roughly the same number of teams competing for the 16 advancement slots available to qualifiers, each qualifier would end up with 4 advancing teams. If there are only three qualifiers, each would have between 4 and 6 advancing teams. QED. Note that this also assumes that there are no “Qualifier Host Team” advancements (which are optional). If a host advancement opportunity is offered by the Affiliate Partner, that would consume one of the qualifier’s advancement slots available to competing teams. 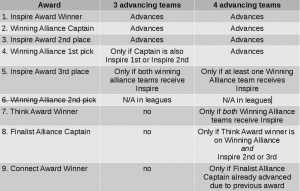 It’s important to recognize that 4-team advancements from a qualifier can be quite different from what happens in a league with 4 team advancements. Qualifying Tournaments — especially those late in the season — often have teams competing that have already advanced at a prior event. This can significantly increase the “depth” of the advancement chart. As an extreme example, at last year’s Summit Qualifier the calculations needed to advance eight teams went all the way down to position #21 on the advancement chart, encompassing all of the teams of the finalist alliances, all of the Think / Connect / Innovate / Design / Motivate award winners, and the Think Award 2nd place and Connect Award 2nd place teams. Another difference is that a Qualifying Tournament with 21 or more teams will have three teams in each of its playoff alliances, which also affects the advancement calculations. Do we really need 80+ Qualifying Tournament slots? I think so. Last season the region had around 100 teams competing in FTC. This season the number is likely to be larger — from my ISD contacts I’m aware of at least 14 new teams starting this season. So 120 teams in the region seems like a reasonable (minimum) estimate. If 60 of the region’s teams are in league play, then the remaining 60 teams will need at least one slot at a qualifier event. Since there will be teams (both qualifier and league) that are likely to want more than one opportunity to advance, having 80+ slots available at Qualifying Tournaments seems like a reasonable expectation. As a quick-and-dirty shortcut to all of the above: It seems reasonable to expect that the region is likely to have approximately eight or nine League and/or Qualifying Tournaments this season. There may be fewer than five leagues, in which case there will likely be an additional qualifier, or there may be six or more leagues, in which case there could be fewer qualifiers. No matter how it’s sliced, it feels like eight or nine advancing events is the likely result for the region this season. So if the Regional Championship remains with its 36-team limit, then each of those advancing events is going to end up with an average of four to five advancing teams.